All homes currently listed for sale in the zip code 90813 as of 04/21/2019 are shown below. You can change the search criteria at any time by pressing the 'Change Search' button below. "Here is the opportunity you have been waiting for! The largest penthouse model in the iconic and highly sought-after Masonic Temple Lofts is now available. Rich in history, the 1927-built Temple Loft building originally housed offices and meeting space for an elite social club. It has been re-imagined as a collection of some of the most prestigious and contemporary lofts in Long Beach. This unit features a very open, versatile floorplan with 2 large bedroom spaces, plus 2 upper loft spaces accessed via spiral staircases. Highlights include dramatic vaulted ceilings with brick walls, exposed ducting and sleek concrete floors, central AC, dual-glazed windows and a balcony offering panoramic city views. The open kitchen features custom high-end cabinetry and stainless Viking appliances including a professional-grade gas range with hood, and Bosch dishwasher. Temple Loft amenities include secured entry, subterranean parking - this unit includes 2 dedicated spaces with extra storage room, a separate walk-in storage locker, and exclusive resident access to the Temple Loft clubhouse, jacuzzi, BBQ/firepit, and fitness center. This residence truly has that 'WOW' factor and is a very rare find. Don't miss your chance to own this unique piece of history!" 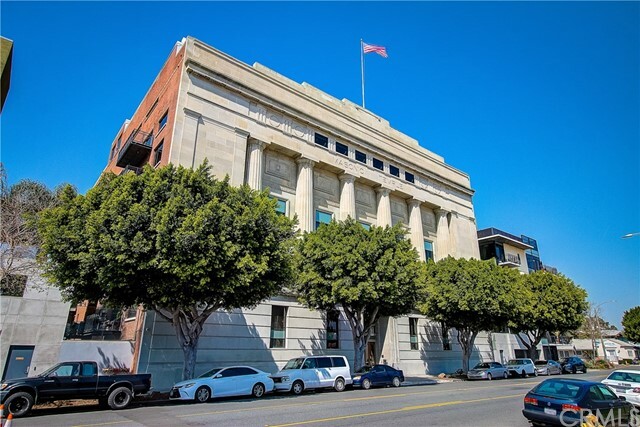 "Welcome to The Masonic Temple Lofts, a stunning Greek Revival architectural style building built in 1927 and designed by architects Parker O. Wright and Francis H. Gentry; considered to be one of Long Beach s iconic and historical treasures. 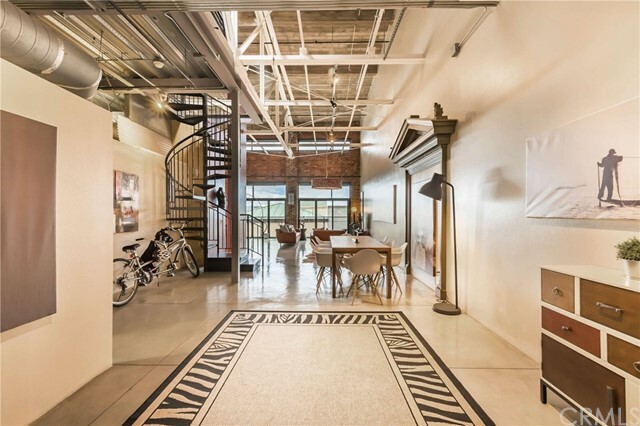 This is a unique penthouse loft located in the original older building. With over 25 foot, open-beam ceilings and large windows you enjoy spectacular sunset views of the Palos Verdes Peninsula. Open floor plan with polished cement floors, the home is sold fully furnished. Exposed brick walls have been sealed to enhance their coloring and over $5,000 of electrical upgrades. Contributing to this home s uniqueness is a rare wooden door frame from the original temple ballroom which presently adorns the wall within the current dining area. The remodeled kitchen has black glass upper cabinetry, stainless clad cabinets below with Red African granite countertops plus high-end appliances. A spiral staircase takes you to a spacious and private master ensuite with a walk-in closet. A spa-like bath with a glass-enclosed shower features dual shower heads and imported tumbled glass tile. There is a second bedroom downstairs. 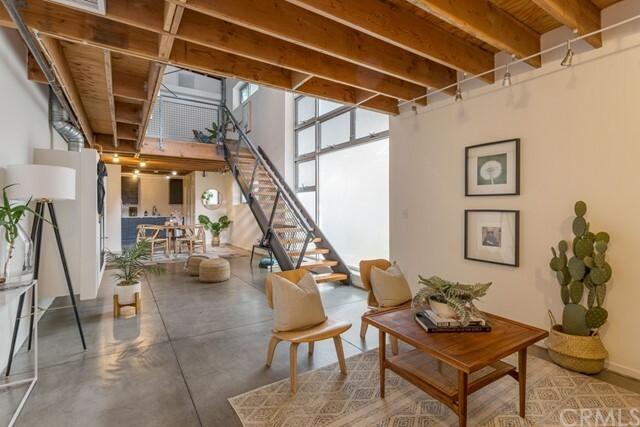 This loft is one of the very few that offers two bathrooms and has the potential to increase its square footage with another second-story space. The building s grand lobby area and building s amenities include a fitness center, clubhouse, community patio with BBQs and spa, plus 2 parking spaces and storage facilities." "This Craftsman Style Duplex is geared for creating income, or owner user who needs a large home. 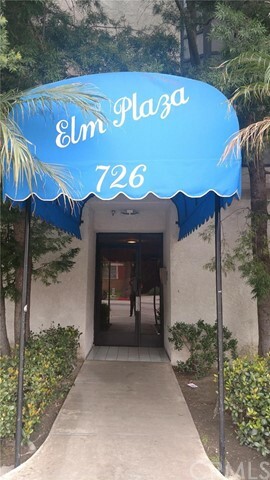 Located in the up and coming Craftsman Village part of Long Beach, these units have proven to have a consistent track record of generating a great income. The large front house has approximately 6 rooms being used as bedrooms (perfect for the college students who currently reside), 2 full bathrooms and is very spacious with a great floorpan. The rear house has 4 bedrooms and 2 more full baths and also is rented for a roommate type situation. 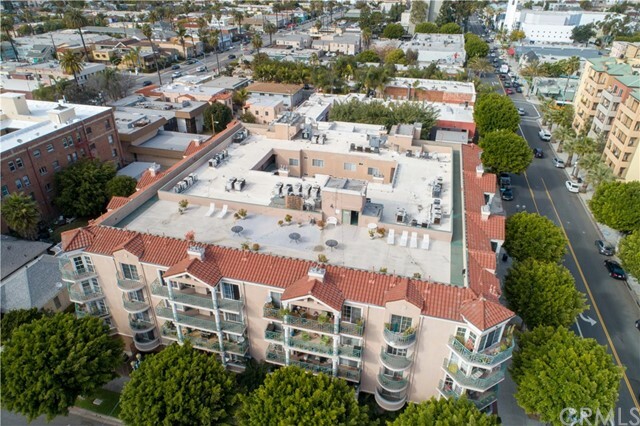 Both units have their own laundry, off street parking for two cars each have their own private patio area, and a super large lot of almost 6,000 sq ft. Over 2700 sq ft of property! Consistent great, long term tenants make this a bread and butter winner. Huge Price Reduction!" 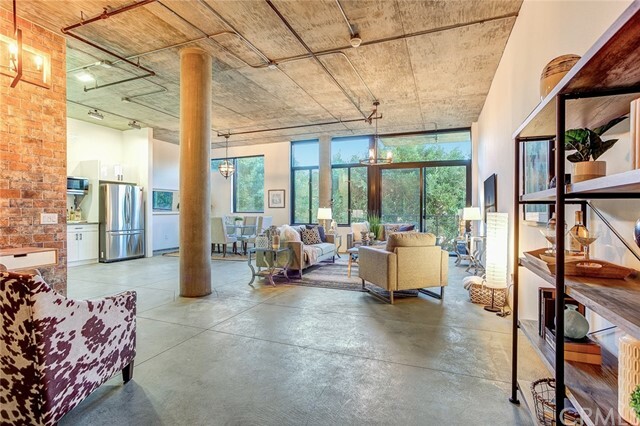 "Now s your chance to own one of these highly sought-after Temple Lofts! This loft has been completely renovated including a beautiful master bathroom with stand-up shower and dual sinks, all new powder room, brand-new kitchen complete with stainless steel appliances and quartz countertops, and industrial chic lighting and accents throughout. In addition to the kitchen appliances the unit comes with an all new stackable washer and dryer. There is a dining area that can easily be converted into an office if desired. The loft has high ceilings with exposed pipes and concrete flooring along with a deck perfect for those summer BBQ nights! Temple Loft building is 24/7 secured and amenities include a fitness room, common area with spa, firepits, and BBQs, a billiard room, underground parking garage, and a large storage locker. The former Masonic temple is located in the heart of downtown Long Beach just steps from the restaurants, shops, and bars on Pine Ave. This is urban living at its finest! Hop on this one before it s gone!" "Stunning remodeled Victorian home located in a great area in the Willmore Historic District. Property remodeled with modern amenities while preserving its original and historic charm. There are two Master Bedrooms, one upstairs and one downstairs. The house is upgraded with LED lighting, upgraded kitchen with quartz countertops, stainless steel appliances and new tile flooring. The dining room has a custom tiled fireplace and an antique chandelier to match the ambiance of this historic home. Incredible location and minutes to the beach, Arts District, The Pike, Shoreline Village, freeways, Queen Mary and the Metro Blue Line. Property has month-to-month tenants so only showing upon accepted offer. DRIVE BY ONLY. DO NOT DISTURB TENANTS." "Welcome to the Courtyard Lofts, originally designed by award winning architectural firm Interstices! This intimate 16-unit community is home to some of the most unique lofts in Downtown Long Beach, and unit 835 (aka 849 Pine Ave. #H) is no exception! The open floor plan features a large living space, two-story ceilings with exposed wood beams, dining area and kitchen, with a second floor that is ideal for a separate sleeping area and office space. Natural light pours in through the wall of windows and the unit has new paint throughout. In the recently remodeled kitchen you will find quartz countertops, beautiful subway tile backsplash, LG appliances, gas range, dishwasher, garbage disposal and built-in microwave. This unit also includes one assigned parking space in the private garage. The Courtyard Lofts are nestled on the upper end of the Pine Avenue dining and shopping district, with metro stations nearby, and soon to be open Rose Park Roasters coffee shop! Don't miss out!" 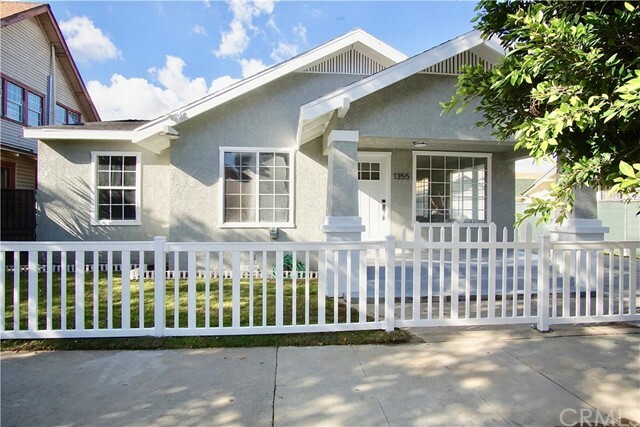 "This stunning, single story home has been remodeled from top to bottom! Boasting 3 bedrooms and 2 bathrooms, this property has a beautiful new vynal fence in front, a new kitchen with quratz countertops, new stainless steel appliances, new cabinets and sleek fixtures, new distressed wood laminate throughout along with new baseboards and molding. Both bathrooms have been upgraded with beautiful finishes. The home is set up with a Ring alarm system. There is ally access in the back that could potentially be used as RV storage or extra parking! With a detached 1 car garage and a backyard for entertaining, this is the home your buyers have been waiting for!" "This historical area of Long Beach offers a 2 story home with 4 bedrooms, 2 bathrooms, and a detached 2-car garage that was built in 2008. One bedroom is downstairs for your conveniences. There is a gated, long driveway for plenty of parking space. 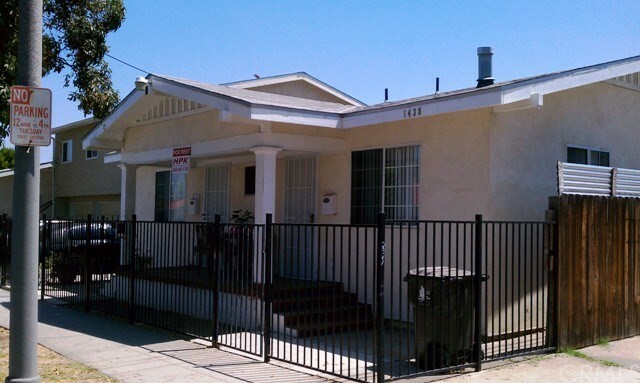 This gem is near many markets, shopping centers, public transportation , and 710 freeway. This home need TLC with your personal taste. Will not last long!" 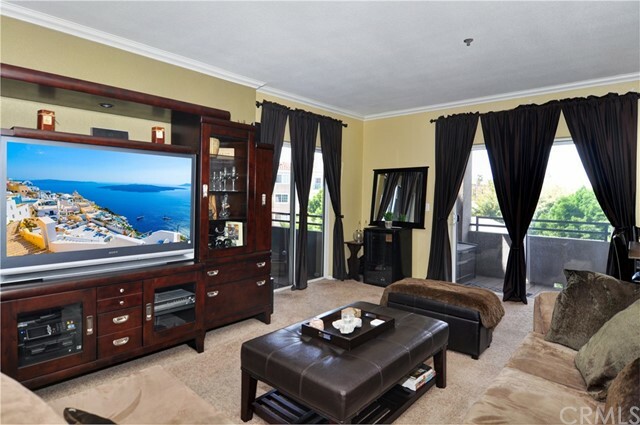 "Highly desirable, Downtown Long Beach condo, features a gourmet kitchen with updated cabinets & spacious countertops. Two bedrooms, 2 bathrooms with 2 parking spaces and up to 6 guest parking spaces in the lower garage makes this condo a rare opportunity that won't last long! Each room has its own walk-in closet, while the Master Suite has an additional full-view mirrored closet so you can check your ensemble before heading out. The living room gas fireplace is connected to an outdoor bbq grill located on the spacious balcony that overlooks the city horizon, sunsets and neighborhood, which is easily accessible from every room. Located up the street from local shops, restaurants, entertainment and transportation - this condo is shown as a very high score of 95/100 for convenience! Residents love that they are close enough to get in on the downtown action without having to call an uber or lyft and just far enough to enjoy some peace and tranquility. This is truly Downtown living at its finest with room for entertainment on the panoramic roof deck, zen courtyard and community room where many parties can be hosted, as well as your very own wet-bar at home, where you can hang your wine glasses and store your special beverages of choice! Welcome to your new home!" 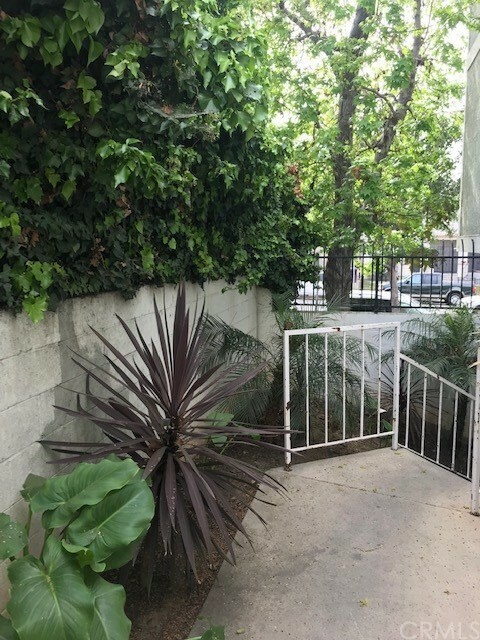 "Immaculate one bedroom, one bath is in the center of the thriving downtown area of Long Beach. This spacious home boast many pride of ownership upgrades particularly noticeable in the kitchen, suitable for any home chef with it s stainless steel appliances, convection stove, distressed wood flooring, granite counter tops, glass tile back-splash, under cabinet lights and plentiful cupboard space. The kitchen opens up to the large living room with access to two balconies that create great natural light and beautiful views. The bedroom is spacious enough for your king size bed and has a large closet with built-in organizers, the master bedroom has it s own balcony with living room access. The bathroom gives a spa like feel with granite counters, fresh white shower in tub with glass doors, and tile flooring. Central heating and air, tinted sliding balcony doors, as well as in unit laundry adds to the comfort and conveniences of this living space. Parking is not an issue with two subterranean parking spaces. The complex has a welcoming entry, foyer, common barbecue area, and roof top covered deck with a spectacular 360 degree view of the city, great for any gathering or just a day of lounging. This property comes fully furnished so all that is needed to make it the perfect home is you!" "Welcome to a modern 2 bedroom 2 bathroom home just minutes away from the beach. This unit displays newer amenities throughout. The elevator takes you up to the third floor where you are just steps away from your door. Once you enter the unit, you are faced with a panoramic window view of the city in the living room, parquet wood flooring, and a stone tiled fireplace. The kitchen features a stainless steel microwave, stainless steel refrigerator, stainless steel stove, and a stainless steel dishwasher. The first bedroom also has parquet wood flooring, a door leading to the first bathroom, and dark wood shelving. The first bathroom has a modern sink, faucet, toilet, and a walk-in shower with a rainfall shower head. The master bedroom features a floor to ceiling mirrored closet doors, a top up bottom down window shade, ample room and private full bath. Ceramic flooring covers the entry way, kitchen, and bathrooms. The entry way has an enclosed closet with a washer and dryer. A closed in parking stall and storage can be found on the first floor. The perfect home for entertaining and relaxing." "Beautiful unit for first time home buyers or buyers who are downsizing. Close to public transportations ,schools and short drive to the beach. 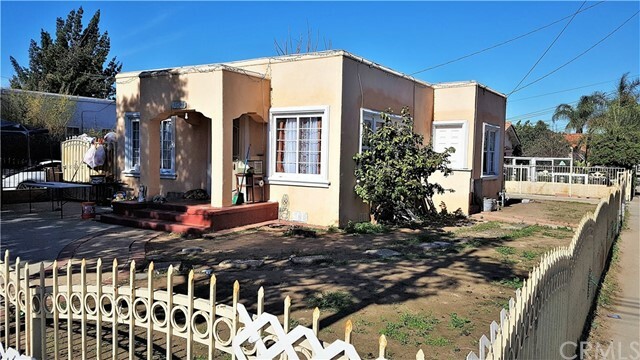 Buyers and buyer's agent to verify the condition and all information on this property on their own and must satisfied themselves as all aspects of this property." 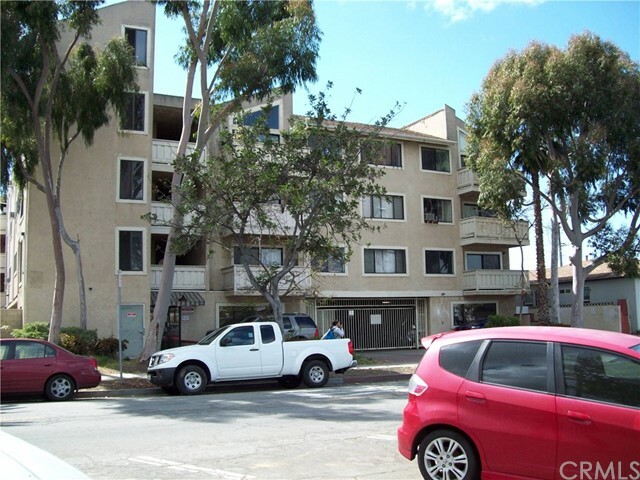 "Beautifully well maintained and move-in ready 2 bedroom 2 bath condo in the Alamitos Beach area of Long Beach. 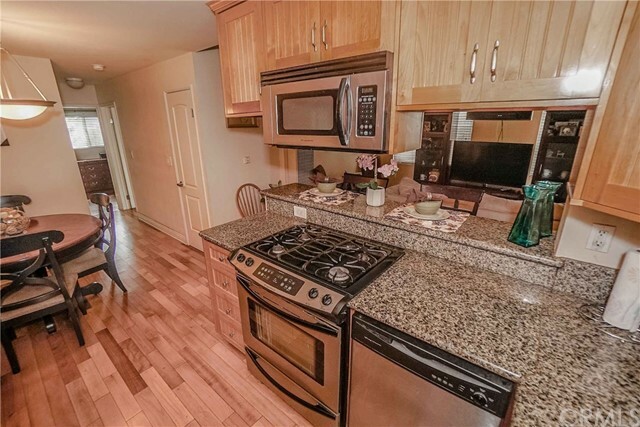 Kitchen offers granite counters, stainless steel appliances, built in microwave. Ground floor end unit. Laundry hook-ups in the unit and includes the washer/dryer and refrigerator. Ceiling light/fans in living room and both bedrooms. Absolutely move in condition. Secure complex and one designated parking space close to the unit, plus storage cabinet." 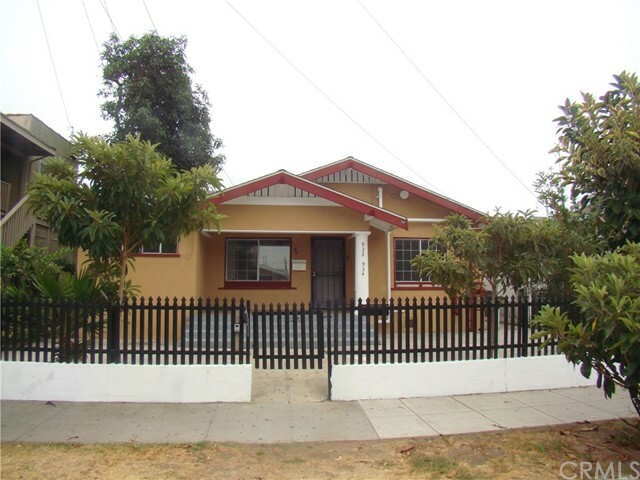 "Centrally located in the heart of Long Beach. Close to Schools, freeways and biking distance to the beach. Top floor flat unit with cathedral ceilings and panoramic views of the hills, city lights and back bay from the living room window. Upgraded kitchen with granite countertops and oak cabinets. Nice, quiet complex." 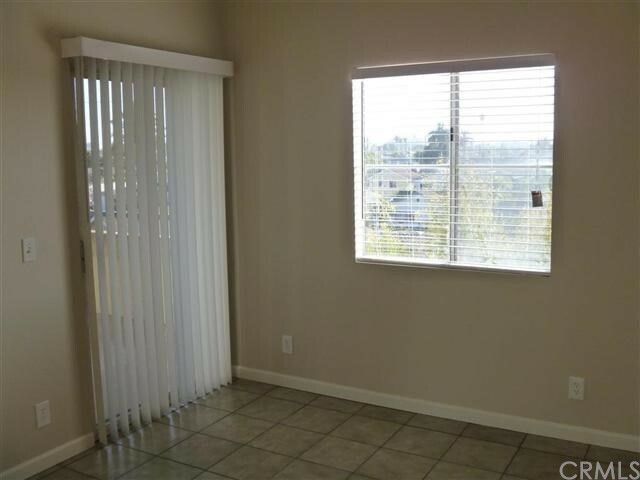 "Beautiful Condo in the down town are of Long Beach. 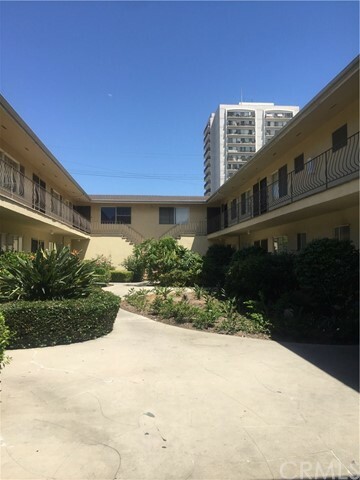 This condo Boasts 2 very big bedroom 2 full baths, 2 parking space which is hard to find in down Town Long Beach. In a gated community. Less than 3 miles from the Long Beach Aquarium, Beaches and Down Town shops and restaurants. Within Walking distance to the George Washington Middle School. 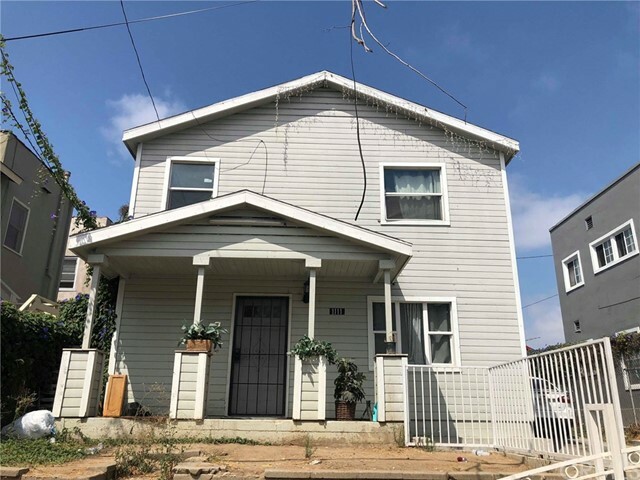 This is Perfect for the first time home buyer or the Savvey Investor that are that are looking to invest in the beautiful City Of Long Beach." 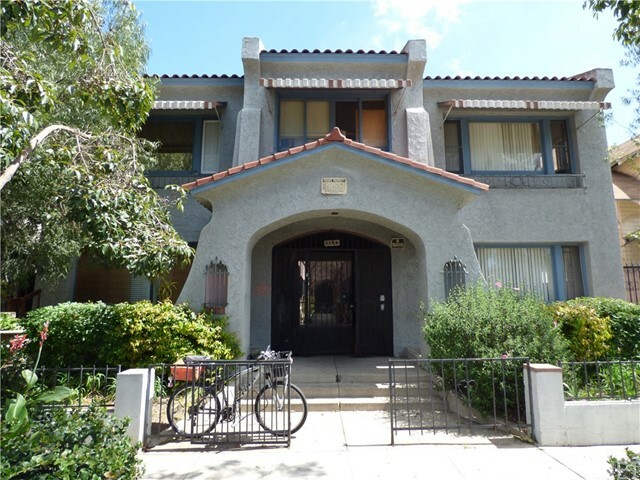 "Downtown Long Beach 1 bedroom 1 bath OYO - with 1 car garage! Recently renovated, unit currently occupied. Conveniently located near city service, public transportation, shopping and dining." "Probate - Court confirmation required. Los Alamitos Own-Your-Own fixer. One mile from the beach. CASH OFFERS ONLY. Unit will not qualify for financing. Close to Downtown Long Beach."